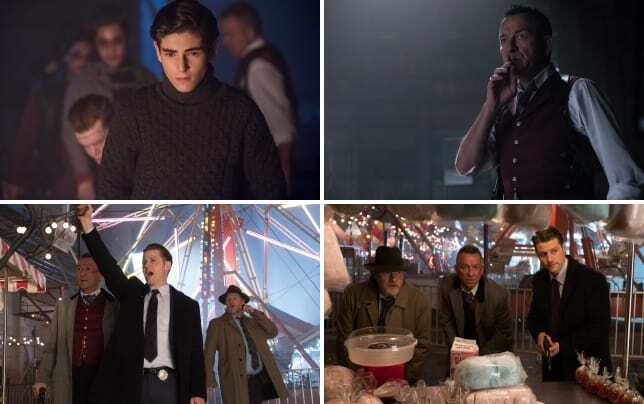 There were plenty of thrills and chills on Gotham Season 3 Episode 14 as both Bruce and Penguin faced their futures. But one of them wasn't as lucky as the other. Jerome might have thought he was the star of the show, but Bruce took that mantle right out of his hands. From the moment Jerome showed up at Wayne Manor until the very end at the funhouse, Bruce was in control. Not only of himself, but of the entire situation. Jerome had no idea what was happening, and he certainly wasn't expecting any of it. It was a proud moment watching Bruce come face to face with his future self. Things started to click a long time ago with Bruce, but it really hit home when Jerome told him there were no heroes in Gotham. Alfred: There's a very fine line, Master Bruce, between justice and vengeance. Bruce: I know. But that doesn't mean there isn't one. Bruce: I knew where the line was tonight, Alfred. I didn't cross it. Permalink: I knew where the line was tonight, Alfred. I didn't cross it. For a moment, I did think he was going to kill Jerome. After all, he's still a kid, but Bruce took control of emotions and it was great to witness! 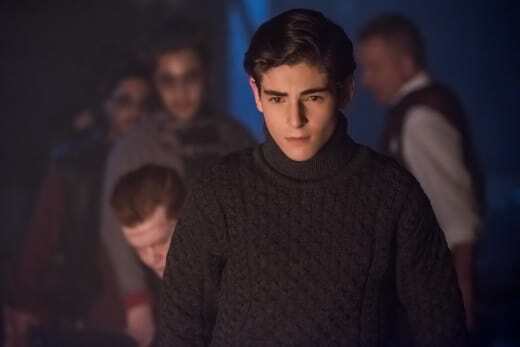 David Mazouz was perfect in every aspect this hour. This time around he deserves the standing ovation. Jerome was just a backdrop to his outstanding performance. It's not to say that Cameron Monaghan's Jerome wasn't scary, but there just wasn't as much punch to him as when he was alive. I guess death will do that to you. Gotham Photos from "The Gentle Art of Making Enemies"
Not that it was an easy defeat for Bruce, either. Bruce is still a teenager and he faced a grown man with courage and strength. 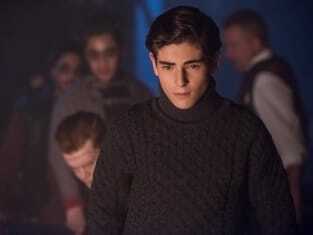 I loved when he looked in the mirror and realized he couldn't bring himself to kill Jerome. Not because he was afraid, but because he was better than that. The fine line between justice and vengeance wasn't crossed and it never will be. And that's the way it's supposed to be. I liked that both Jim and Alfred took a backseat this hour as well. Bruce showed he didn't need either of them to save the day. Bruce did it all by himself and he did it without showing any fear. The only problem now is what the Court of Owls might have in store for Bruce. Their Doppelganger appears to be in fine form. And what's the deal with Uncle Frank? What's he planning for Jim? I get the feeling it has something to do with Doppelganger Bruce, and I hope we delve more into it as part of the main story than just these little teases we get every once in a while. Unlike Bruce, Penguin was a big disappointment. Enough is enough with his neverending love for Nygma. How far is this going to go? I don't believe for a minute that Penguin will die, so let's get that off the table right away. There's no way the show is going to get rid of Oswald Cobblepot. Love is about sacrifice. It's about putting another's needs ahead of your own. Permalink: Love is about sacrifice. It's about putting another's needs ahead of your own. What I'm hoping is that his near death experience (how many is this now?) will finally set his head straight so he can go back to the wicked Penguin we know and love. This wimpy Penguin is tiring. Tabitha hit it on the head when she told him he did nothing to her after she killed her mother. That in itself should have enraged him so much that he would have tried to fight his way out of that chair. Not sat there and groveled for his life. He also should have shown outrage when Nygma admitted to digging up his dad. It was ridiculous that he just let that go like it was nothing. I just had a hard time with it all. Still, it was shocking to watch Nygma shoot Penguin. At one point, I really didn't think he'd pull the trigger, because if he was really serious, why bother with the acid gizmo earlier? But, he did and now we wait to see how Penguin survives. Did he purposely send the policeman in there to save Penguin? Was that part of the overall plan, because I missed it if that was mentioned. It would be the only thing that would make sense for why Butch and Tabitha were waiting for Penguin at his house. Otherwise, how would they have known he escaped? 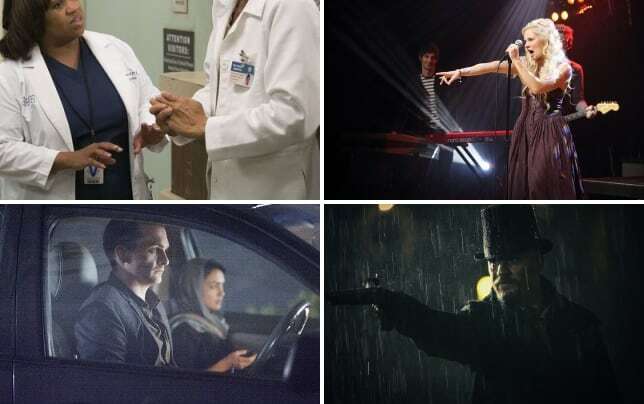 "The Gentle Art of Making Enemies" was one crazy hour of television, but it was also one of Gotham's best. Justice and vengeance was the main theme of the hour with Bruce taking the side of justice and Penguin being set up for vengeance like we've never seen before. How did the circus have power when the rest of the city was without? Jim punching Jerome's face off was sort of funny. Even better was Bullock's joke regarding it. What happens now that the crystal owl is broken? Where was Selina during all this craziness? How long will Jerome survive in Arkham? Will he team up with Barnes and Jervis Tetch? What did you think of this crazy hour? Is Penguin really going to die? What is happening with Doppelganger Bruce? How soon before Bruce dons his cape and cowl? What does the Court of Owls want with Jim? If you need to catch up or just want to see all the excitement again, you can watch Gotham online right here via TV Fanatic! You and I both know that a man will say anything to save his own life. Permalink: You and I both know that a man will say anything to save his own life.